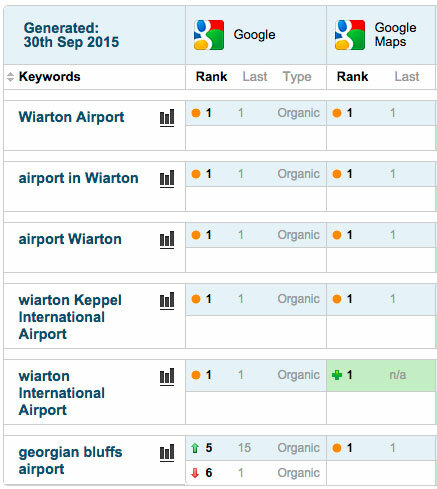 The Township of Georgian Bluffs, for the Wiarton Keppel International Airport website, contacted us wanting to get higher in the search engine ranking results namely page one. Their existing website www.wiartonairport.ca was not coming up anywhere in the top of the search ranking. They could be found on the fourth or fifth page with keyword search terms that were not even closely related to the Wiarton airport. We walked them through the process, in easy to understand terms, what needed to be done and the rate for each of these items through passive up to very aggressive methods of change. Our client chose to take the very aggressive path in order to get positive results as quickly as possible. What we decided to do was to focus on Search Engine Optimization (SEO). The optimization of keywords is how a search engine, like Google, locates websites on the internet. When it comes down to helping any website ranking out there you need to do a Search Engine Audit. An audit is an analysis of search factors that all search engines approve of that define the website and its sub-pages. 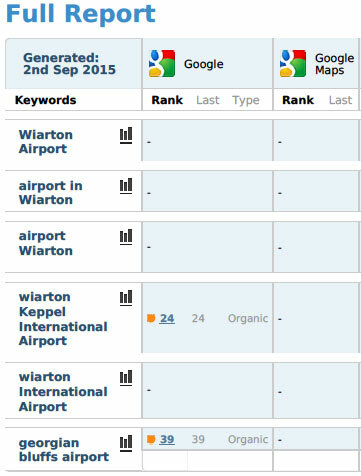 We then performed the SEO on the Wiarton-Keppel Airport website to specific keywords. A keyword search term is one or several words used to present a website to the consumer in the common search engines such as Google, Bing and Yahoo. Defining your keywords is pivotal to measuring your online business success. This gives search engines, like Google, clues to help rank the website based on specific keywords. Most clients are defined by five to ten keywords based on the market that they wish to target. Here is a screenshot of where they were ranked before calling us. These rankings are not static, they are continuing to improve over time. Search Engines take time to improve and continually update their rankings. No one, except Google, knows specifically what the Google algorhythm is one hundred percent. There are, however, various foundational SEO techniques that can be used to help a website improve their rankings faster or at all. If you look at the examples you will see rankings for Local and Organic search. Primarily, Local rankings on Google show up when a person is local to an area. For example you are visiting Owen Sound, search for “Coffee shop” and a number of local businesses appear higher in the search engine rankings. Organic rankings are for when you are anywhere globally in the world. These rankings are displayed in different ways on Google and are influenced by the cache of search history on your browser. We will highlight, in a future blog, the differences between Local and Organic rankings; for this blog article we want to focus on our attention to SEO and SERPs and the ranking of our client. From our analysis (Audit) we then detailed for the Georgian Bluffs Airport (TIP: we "inbound linked this keyword" with a new keyword to help the rankings improve on a subpage within the website) where the website began, our impact on the search, and the end result proving that their ranking had been greatly improved from page four to page one. For Search Engine Optimization, like Marketing, you create changes to the inbound links to the website, possibly make changes to the physical website itself and then monitor it over time to ensure your impact is successful. An aspect our Search Engine Optimization was to create more inbound links from authority sites and create inbound business citation listings. We will cover the benefits of business citations for increased business exposure on Google in a future blog. And now, this is where they are within one month after we completed the job. The result, we impacted the results within one month. The algorhythm that updates the Search Engine Results Pages (SERPs) cycles on an undefined time frame. In this particular case, the official website of the Wiarton-Keppel Airport updated quickly, not all will have this almost immediate result. The client also desired to have their company appear accurately on Google Maps. A major factor in improving Local results is a Google Business Page; that is what shows up on Google Maps. This page has a substantial impact on Local search results. All businesses should have and have ownership of their Google Business Page. We set up such a page for all of our clients, it is one of the first steps to impacting search engine results in any field. To set up a Google Business Page you must also have a Google email account which we can establish for you. This will allow you to control your Page in the future for updates and adjustments. While Google does not share their SEO rules publically, we’ve found over the years ways to keep Google happy and show you better in the rankings compared to your competitor. One or two “On page keywords” are one of the ways we achieve this and without getting into the specifics the location of these keywords are part of the process that we understand. The increasing of your rankings on Google is an ongoing effort and while results can be achieved rather quickly the maintenance does not end after the first day. SEO is an ongoing process where “quality content is King” on search engines, news links, blog posts, infographics, YouTube videos, Flickr photos and more. Your quality content is a key in influencing how search engines view your website. In the final ‘wrap up report’ we display the business objective our client wanted us to achieve “put us in top 3 on Google”, our goals in how this result would be achieved “improve SEO and SERPs” to the end result “prove the current ranking of our client on leading search engines”. If you are out seeking a SEO company that will achieve positive results you should always ask for before and after reports. And, if SEO is part of an ongoing plan to serve your company you should receive monthly, or at least quarterly, reports that show the impact of the keywords that you were going after. If you don’t know where you are going how will you know when you have arrived? I read this article and found it very interesting, thought it might be something for you. The article is called Landing Wiarton Airport in Google Top 3 and is located at https://www.gemwebb.com/landing-wiarton-airport-seo-google/.